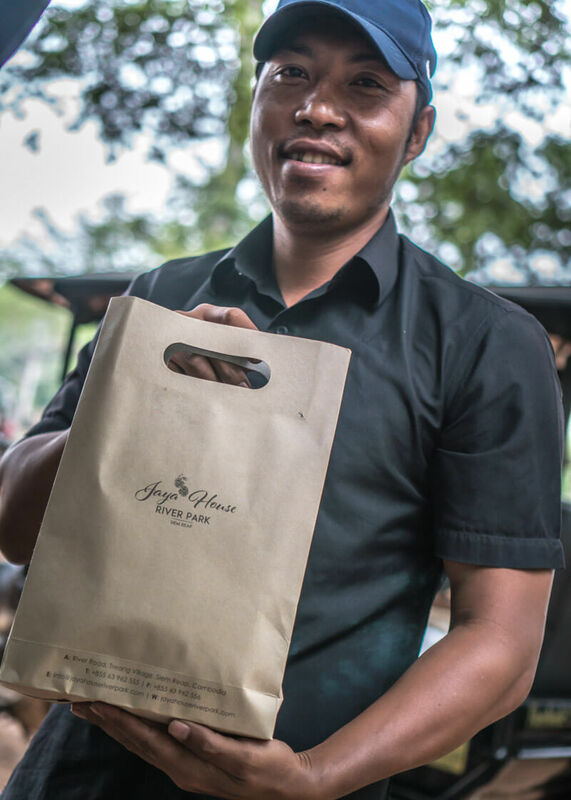 It has been weeks since we left Siem Reap, but my heart is still touched by Jaya House and the way they run their business. Let me explain. I always believed that organizations are in the best position to give back to society. After all, they have the resources and influence to make the world a better place. 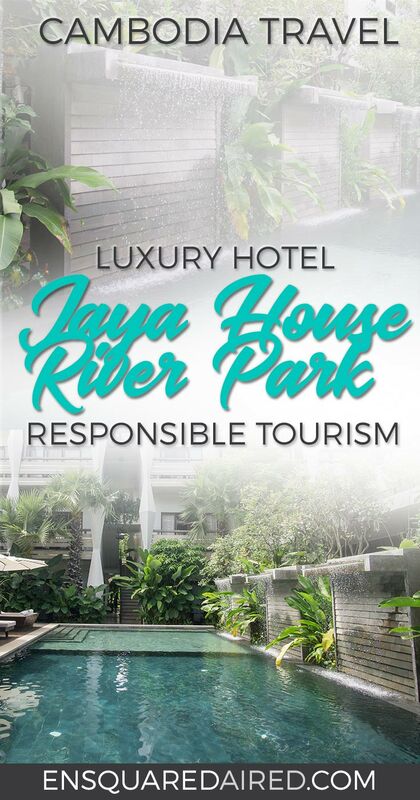 To see luxury hotels like Jaya House demonstrating how hotels can operate in a socially responsible manner is incredible. Jaya House is a leading example of how companies can deliver exceptional service, be profitable, and make a difference in their community. As we entered Jaya House, we knew right away that we were at a place where we will be pampered. At least four employees greeted us with a unanimous “welcome home.” Before we even entered the hotel, two staff members took our bags from us while others greeted us with wet towels. 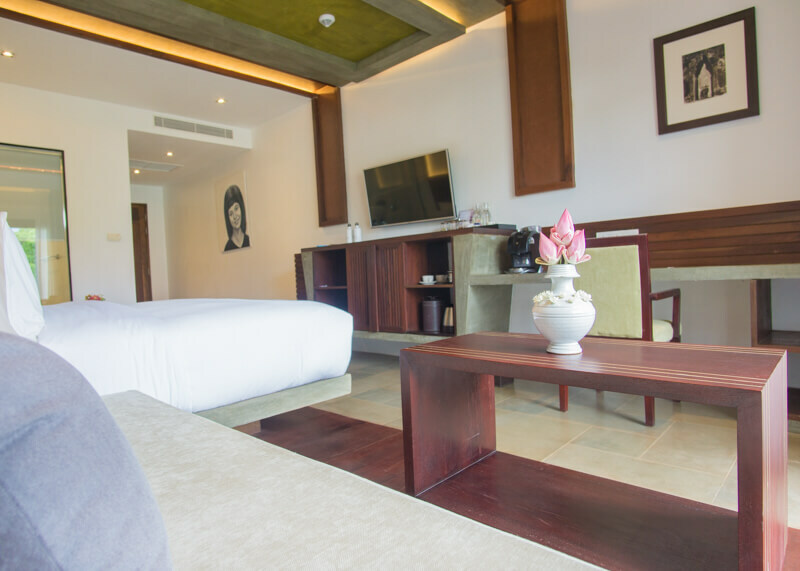 Indeed, Jaya House exudes a chic feel, with bold colours to contrast the white walls. Cultural art accents the hotel, leaving me intrigued about each item. 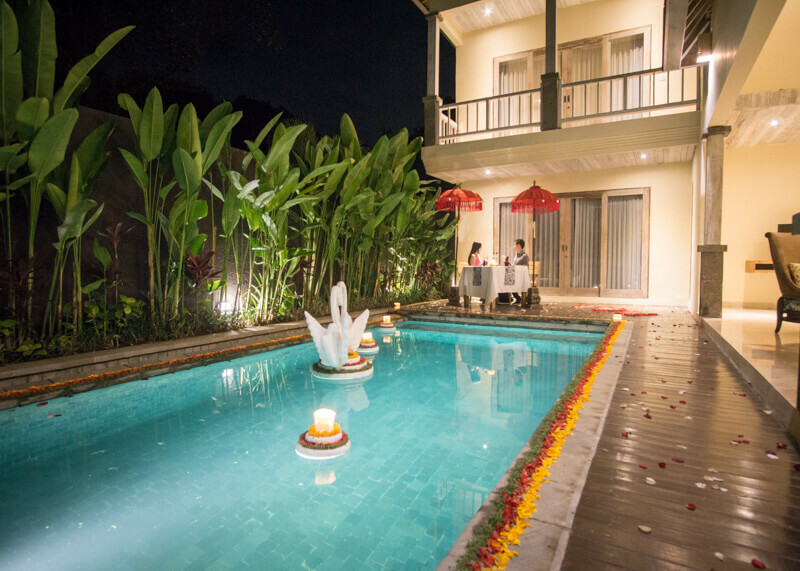 Lush tropical plants and trees surround the property along with beautiful lotus flowers. I had a bit of an obsession with the gorgeous flowers and spent most of my time walking around with at least one in my hand. Naturally, the exceptional service shown to guests takes everything to the next level. 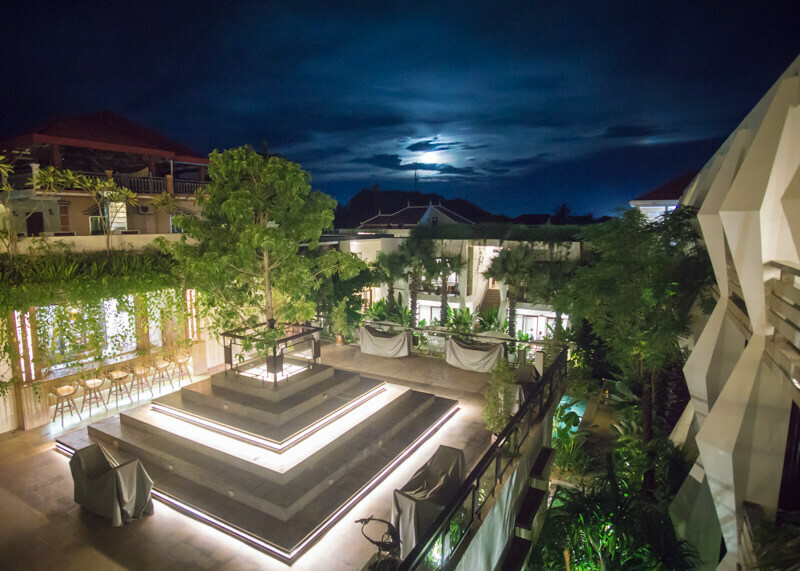 And that’s no surprise considering how Christian, the owner of Jaya House, left a legacy at one of Asia’s best hotels, the Shinta Mani. 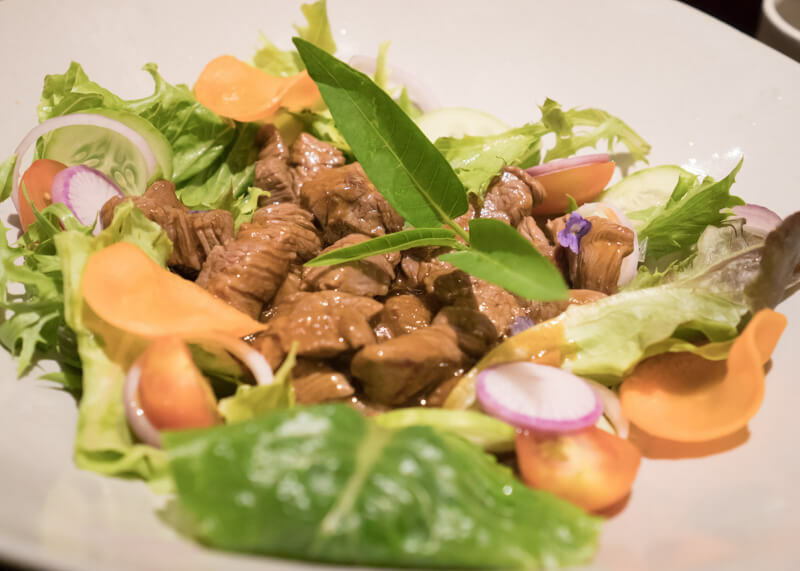 Supporting the Cambodian community and preserving the environment is also on the forefront. More so in Cambodia, because it is one of the most affected countries in the world when it comes to global warming. Plastic is not recycled in Cambodia, which means they end up on the roads, waterways, or landfills. 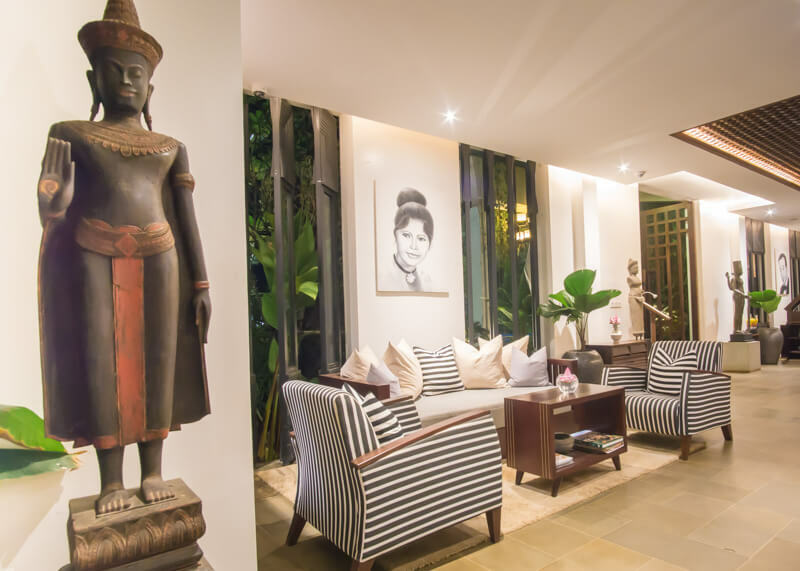 A short walk around Siem Reap will allow you to witness this with your own eyes. The plastic you see around the city is only a fraction of the 355,000 water bottles that get discarded on a daily basis. 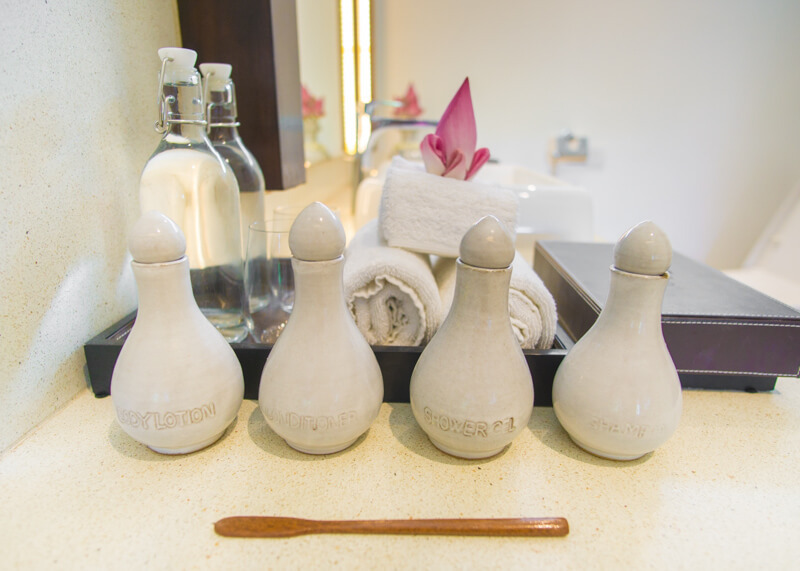 Thanks to these facts, the hotel takes great lengths to avoid plastic in their operations. 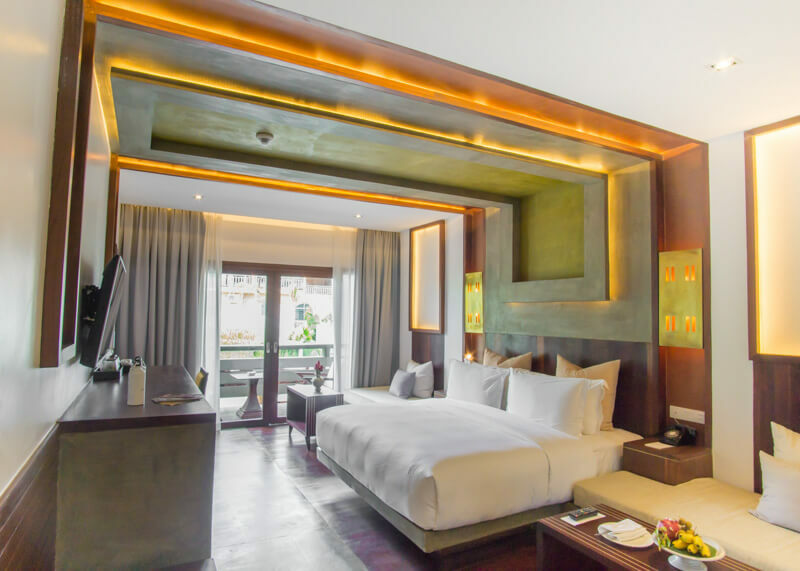 At the time of writing, the hotel is over 95% plastic free. The trash bins are not lined with plastic bags and bamboo straws replace plastic ones. Jaya House even tries to source their supplies in plastic-free packaging. In Asia (and in most hotels), it is common to receive a few plastic water bottles in your room. At Jaya House, they have refillable glass jars in your room instead of plastic bottles. As someone who drinks almost 3L of water a day, easy access to drinking water makes life easier. I don’t have to worry about waiting for boiled water to cool down or deal with buying water in plastic bottles. 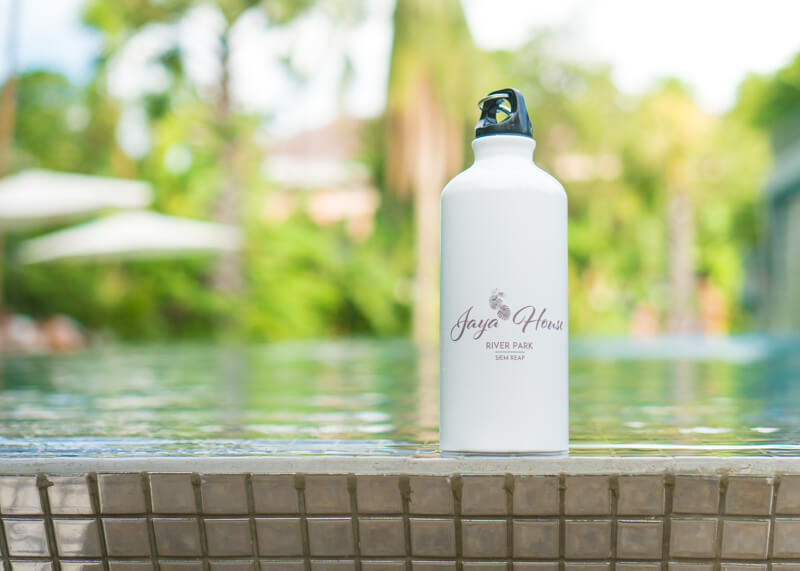 How awesome is it that Jaya House helps guests stay hydrated in a sustainable manner? Jaya House supports a program called Refill Not Landfill. 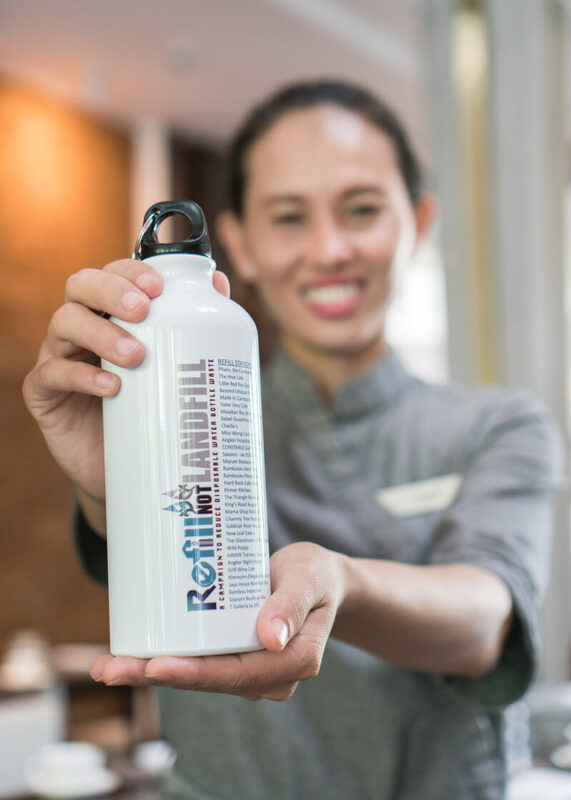 This initiative offers an alternative to plastic water bottles for tourists in Cambodia. The campaign allows guests to get refills across locations around the country. Not surprisingly, water refills are free of charge to tourists. 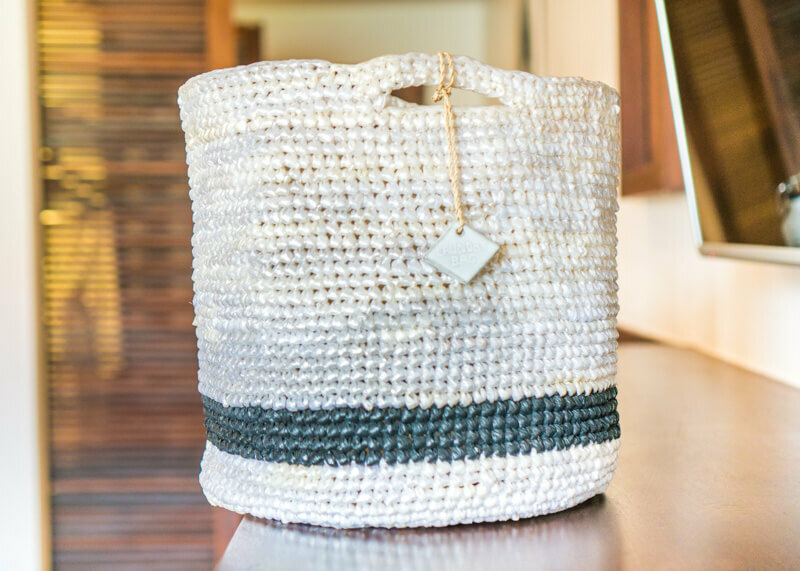 Rehash Trash turns plastic bags into reusable goods while providing jobs for Khmer women. The quality of the products are impressive, and it looks good too! I mean, look at the laundry bag, doesn’t it look like it is made of pretty gems from afar? It’s not until you touch and feel the product do you realize that the material is from plastic bags! This market was founded by Christian four years ago and is a popular place for tourists to visit. You will find high-quality handmade items with a unique story behind every brand. While the market is small, we learned a lot because we took our time and got to know the story behind some of the goods. 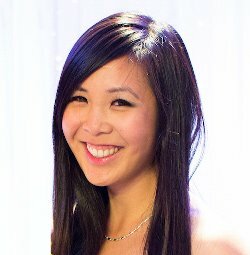 It’s incredible to learn about the process and the uniqueness of each product. 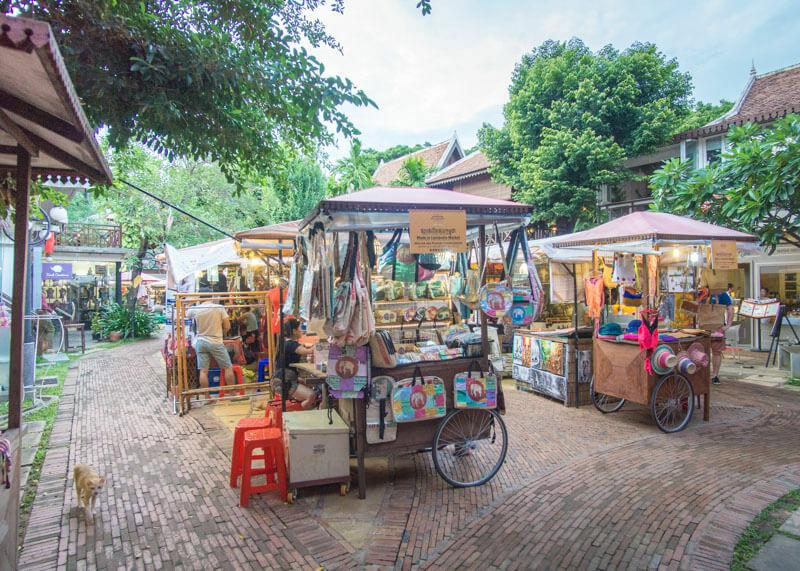 Supporting this market is a great way to help locals directly. Talk about a philanthropic hotel! This list does not include some of the smaller not-for-profit organizations that the hotel assists but does not mention on social media. For example, as we headed down for breakfast one morning, we noticed some Khmer children swimming in the silver pool. 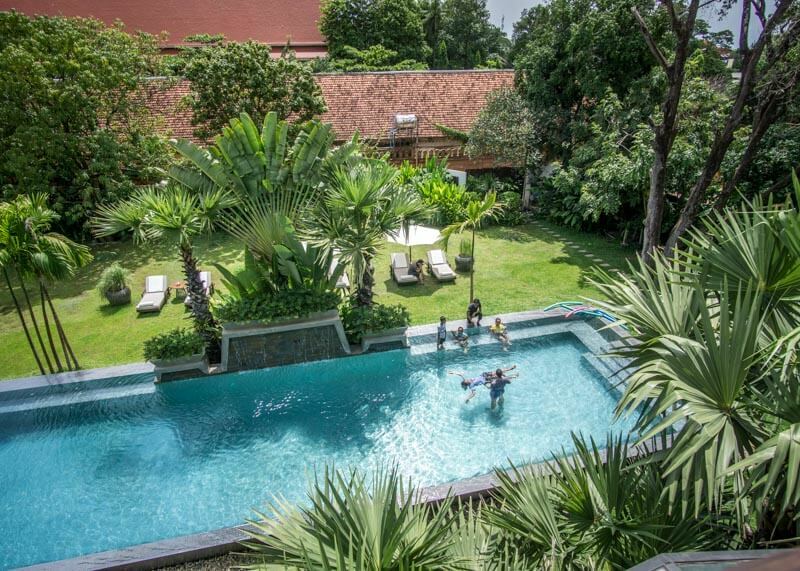 We later learned from Deepool that Jaya House lends their swimming pool during nonpeak hours to a new NGO, called SAFE Waters Cambodia. We met the founder of SAFE Waters Cambodia, where he told us that drowning is the leading cause of death in Cambodian children. Because most homes in rural communities don’t have indoor plumbing, families use wells, streams, and ponds to access water for daily use. Young children who can’t swim are exposed to these unrestricted areas of water and are at risk of drowning. This is the sad reality of life for underprivileged Cambodian children. 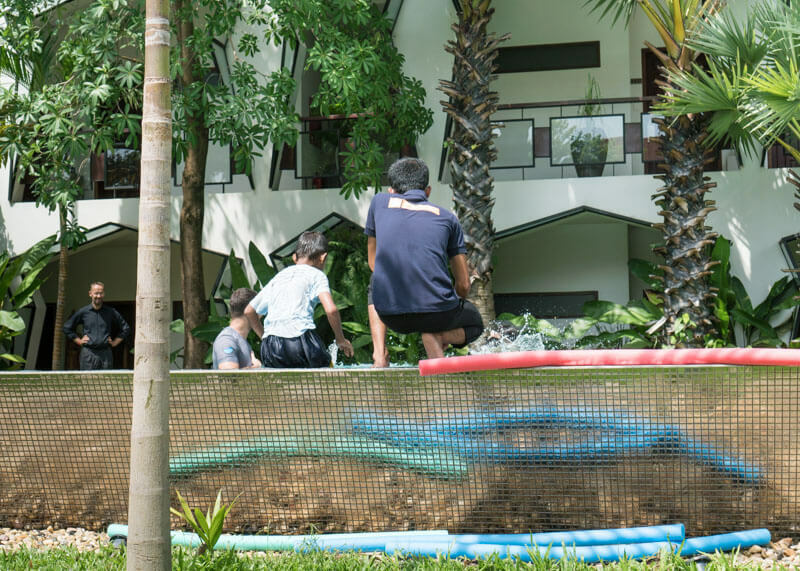 But we appreciated the support that Jaya House lends to Safe Waters Cambodia and learned a lot from our conversations with the founder of the NGO. As we walked back to our room after an eye-opening conversation with the founder, we could not stop thinking about the fact that we would have missed this amazing NGO had we not stayed at Jaya House. 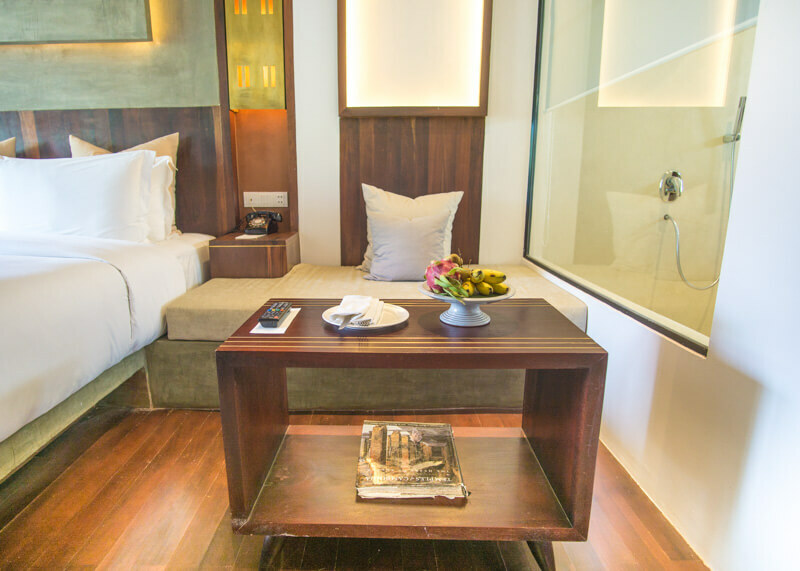 As we entered our deluxe room, we were impressed by the design and functionality of the space. And the beds… the beds were something else. Utter astonishment was how I felt the first time I sat on this bed. I realized right away that this bed is so comfortable that it is dangerous to those who are trying to stay awake (ok ok, for me at least). Each time I crawled into bed, I started to feel very sleepy. The best way to describe the bed is the feeling of sleeping on a cloud that is good for your back. I think the beds from this hotel and the ones in heaven come from the same manufacturer. These beds are one of the best beds we’ve ever slept on in our lives! 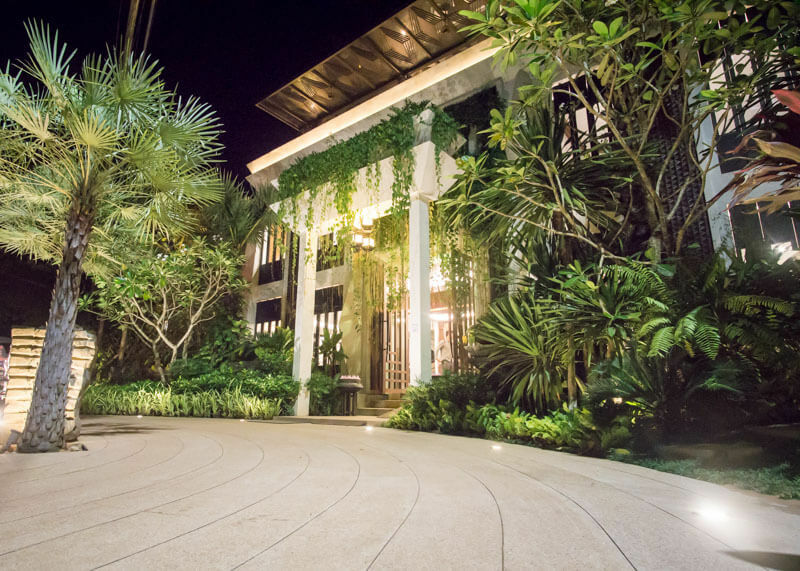 From the moment we set foot through the door, we knew there was something special about Jaya House. It’s almost as if we could feel the positive energy that radiated from the staff. 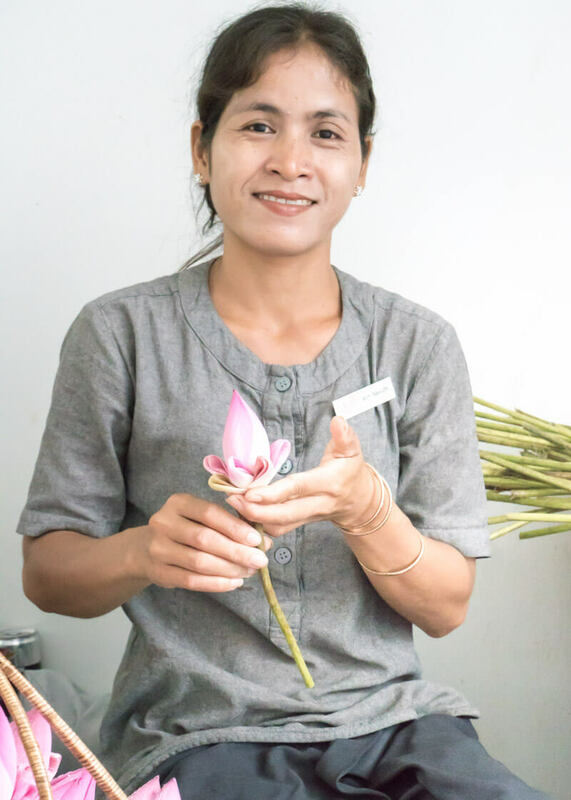 We found that there was always a staff member who was there to make our stay more enjoyable. They were always around, but not in an overbearing manner where you’d feel conscious about their presence. I realized later that their ability to exceed expectations relied on exceptional teamwork and trust. How else would they be able to time the perfect moment to communicate to us in a non-intrusive way? 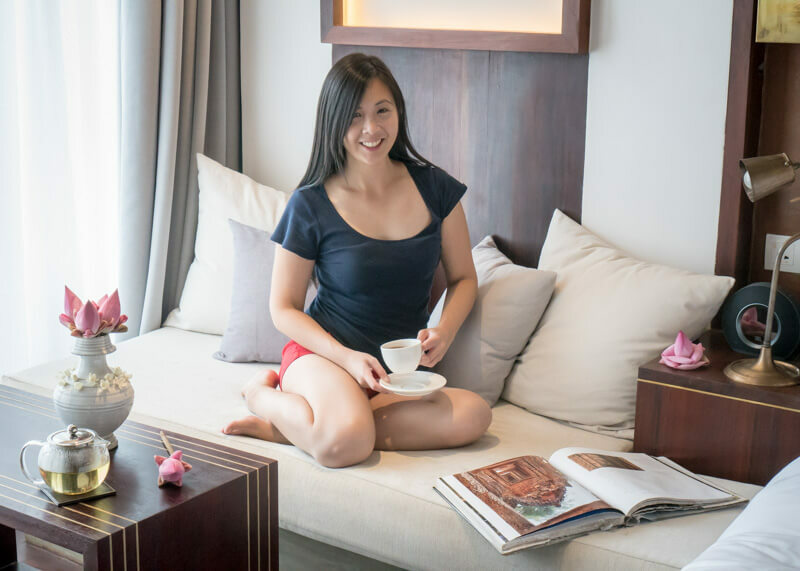 Or welcoming us home while gathering tidbits of info to help plan our itinerary without making us feel overwhelmed? The staff members at Jaya House River Park seemed so eager to grow as individuals, and all are incredibly happy. You can tell by observing them that they take a lot of pride in their work. Some shared their dreams with us and their optimistic views of the future. I couldn’t help but think about how all the employees were very professional and yet personable at the same time. Each person had creative ways to deliver exceptional service. And I believe it is because they had substantial training and trust from management that they will excel. It’s a place where the managers created a safe environment for them to be who they are – accepted, trusted and loved. We spent a whole day with Rambo, our tuk-tuk driver who took us to see the temples. During that time, Rambo shared insights about the forward-thinking attitude of the hotel. 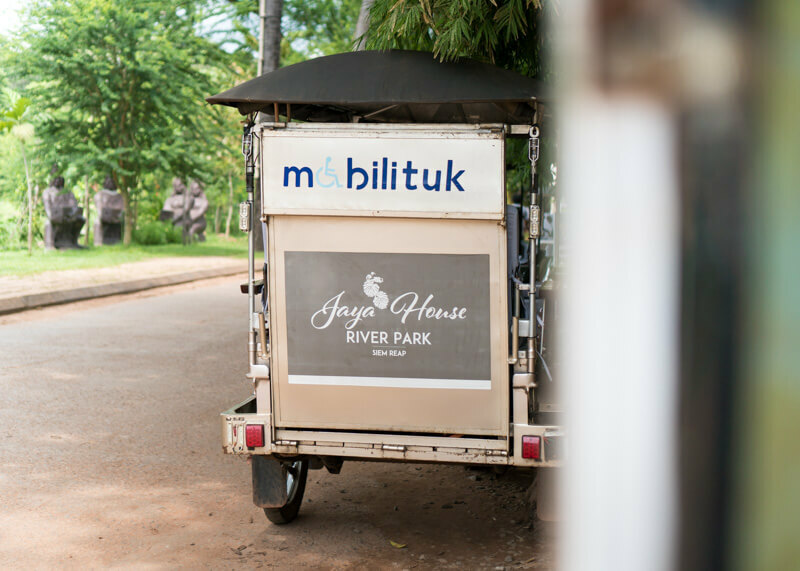 For instance, in a place where tuk-tuk driving is a “man’s” job, Jaya House is the first hotel to hire a female tuk-tuk driver. 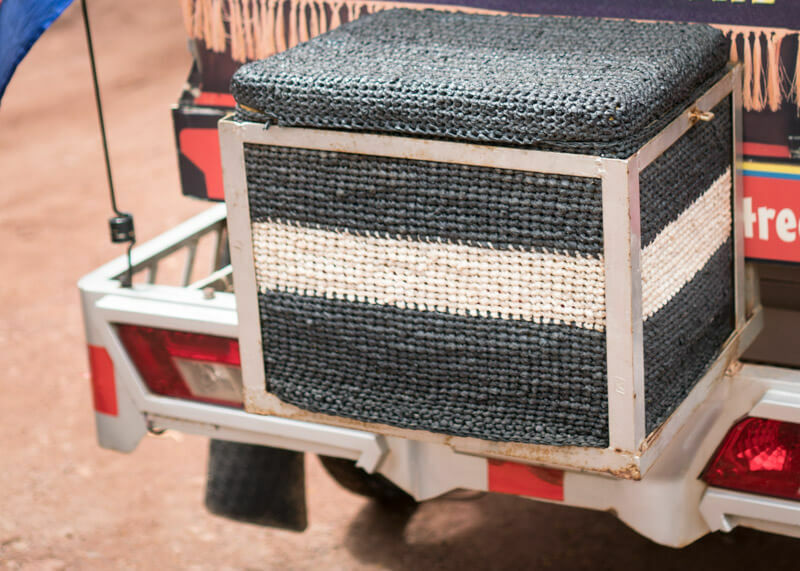 They are also the first to have a wheelchair accessible tuk-tuk, something you don’t come across in Asia. 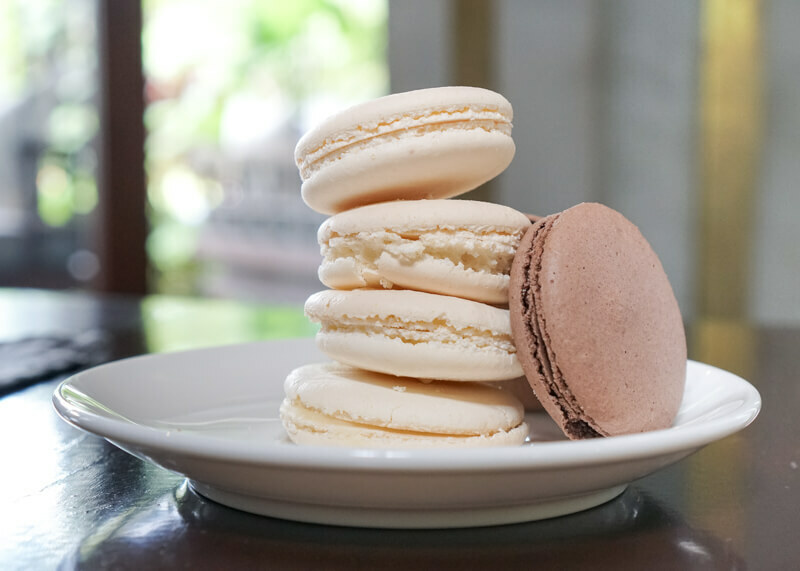 Jaya House serves an incredible breakfast spread with macarons for breakfast! Say whaaaat? Macarons for breakfast? 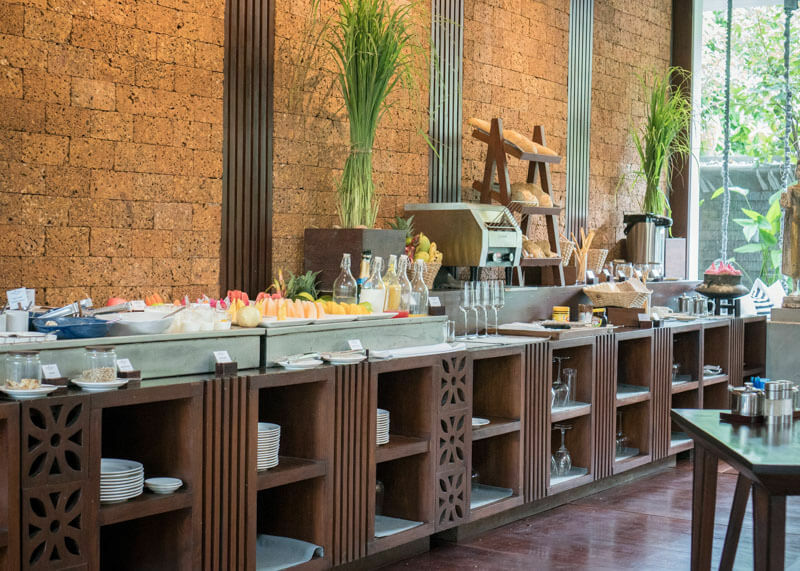 The buffet also includes homemade baked bread, fruits, and traditional breakfast dishes. 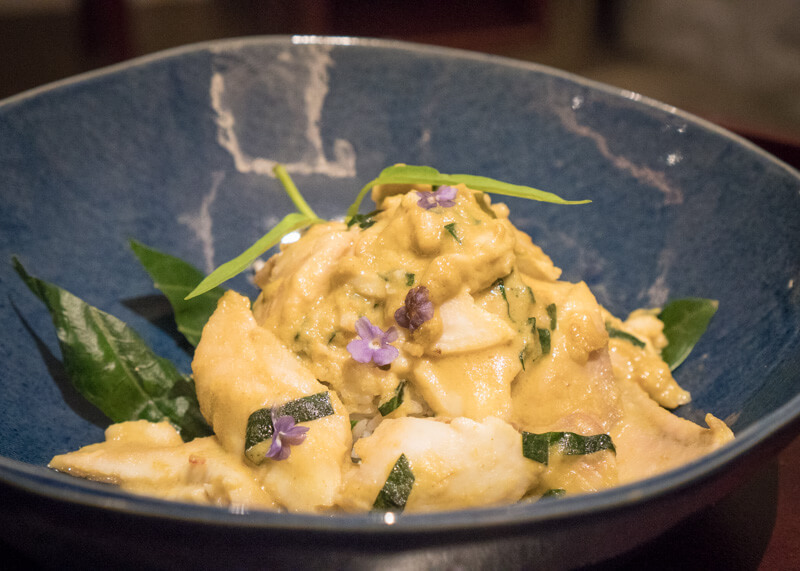 Whether you’re craving cheese, cold cuts or Khmer dessert, there’s something for everyone! There’s even champagne that you can enjoy during breakfast! 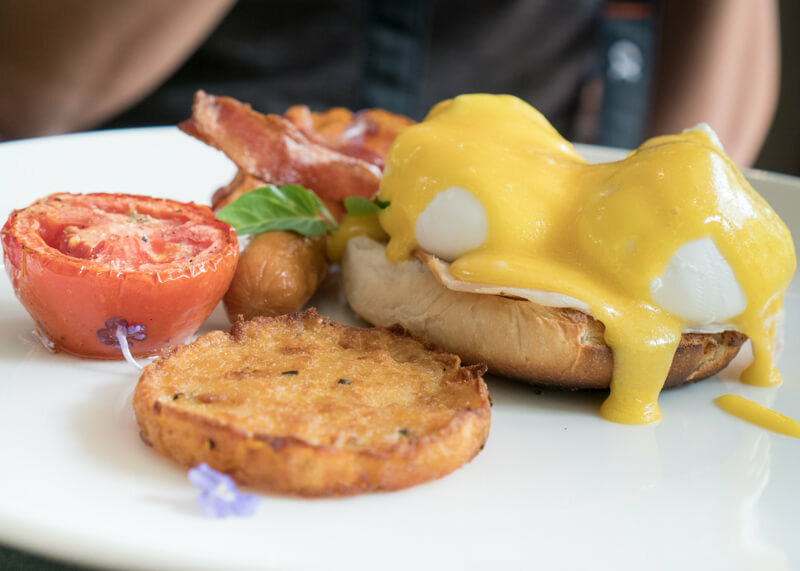 What makes this breakfast stand out is the fresh produce that is sourced by Jaya House. 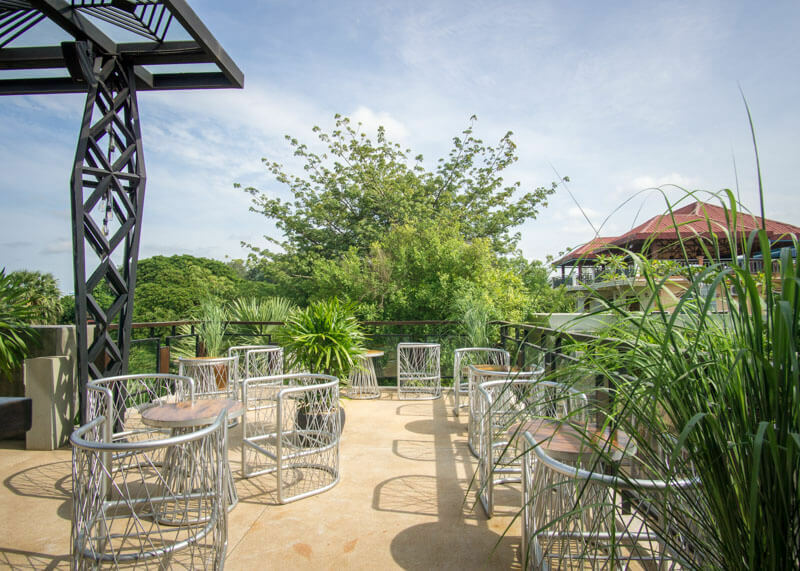 As well, herbs are grown at the hotel’s green roof garden and almost all the bakery goods are made in-house. A la carte options are also available for guests. 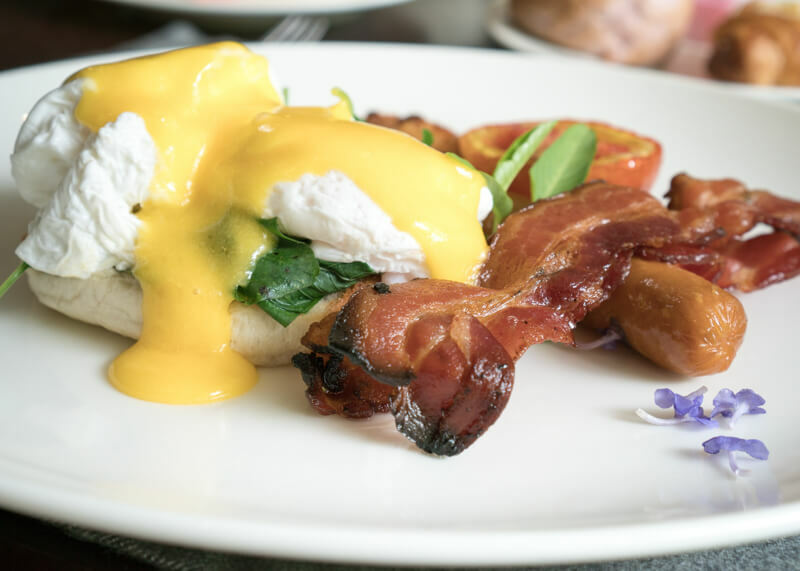 We tried the eggs florentine and eggs benedict, and we were over the moon. The eggs were poached to perfection, and the hollandaise sauce was just right. 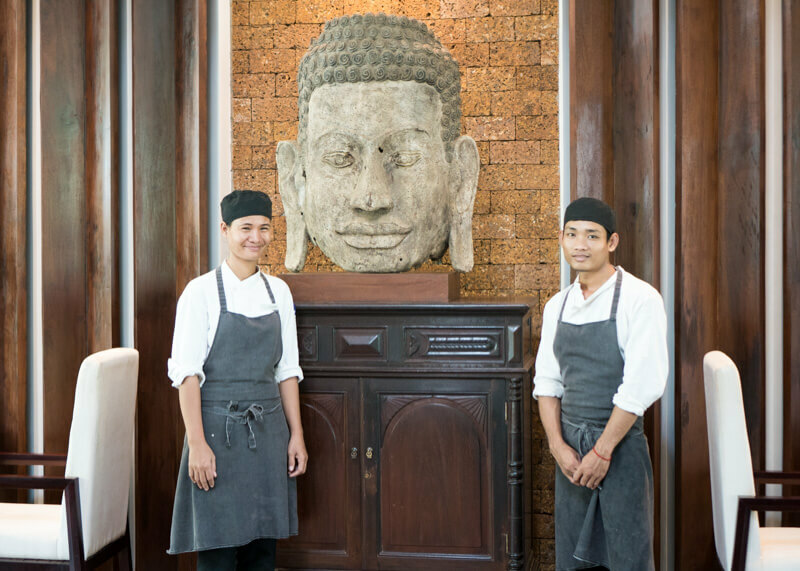 Yon Sophea and Srey Bona worked behind the scenes to make our incredible meals! We woke up at 3:30 am one day to catch the Angkor Wat sunrise. Naturally, I was cranky and sad to be missing their delicious breakfast. But of course, Jaya House had already thought of this dilemma and made sure fruits and baked goods were available for us before we left! They also took our order the night before and packed a heavy breakfast for us. We came back ravenously hungry after a very long day of temple hopping and ordered dinner at Jaya House. As you can imagine, the meal was scrumptious. 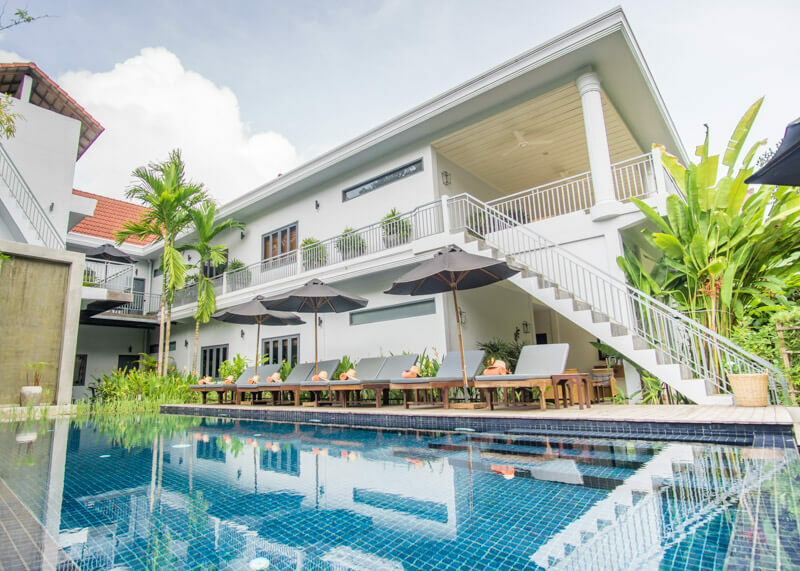 Jaya House has an incredible restaurant, two swimming pools, a spa and a trendy rooftop bar. 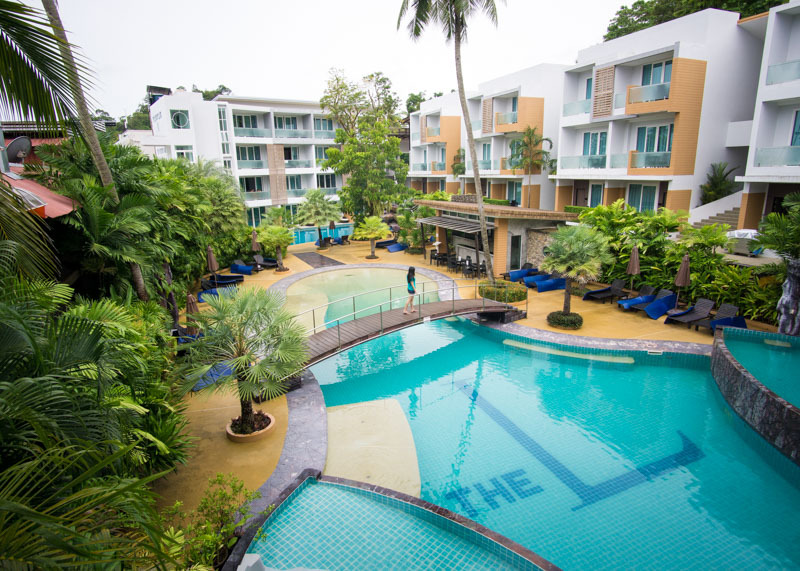 Jaya House has two swimming pools – one with small waterfalls right in the middle of the hotel grounds. The other swimming pool is much larger and made entirely of silver. As you can guess, this pool is stunning. 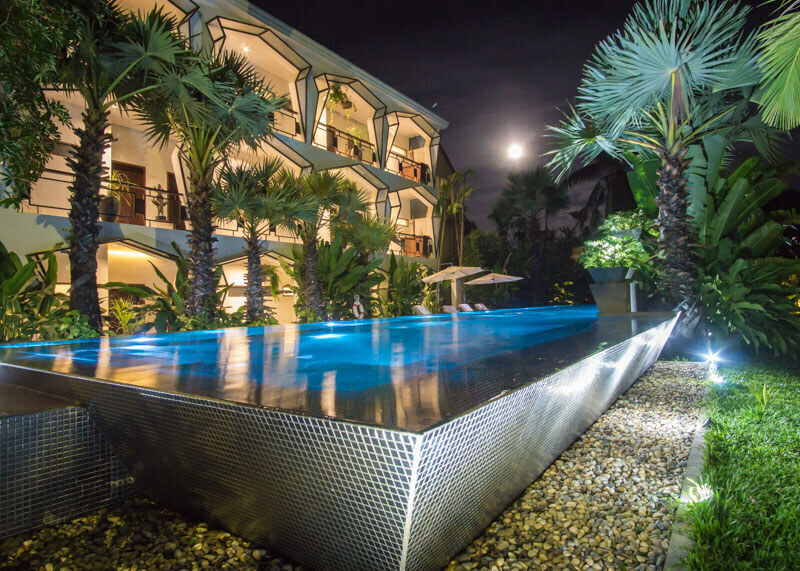 In the daytime, it would glisten in the sun while nighttime brings a futuristic feel as lights illuminate the pool. 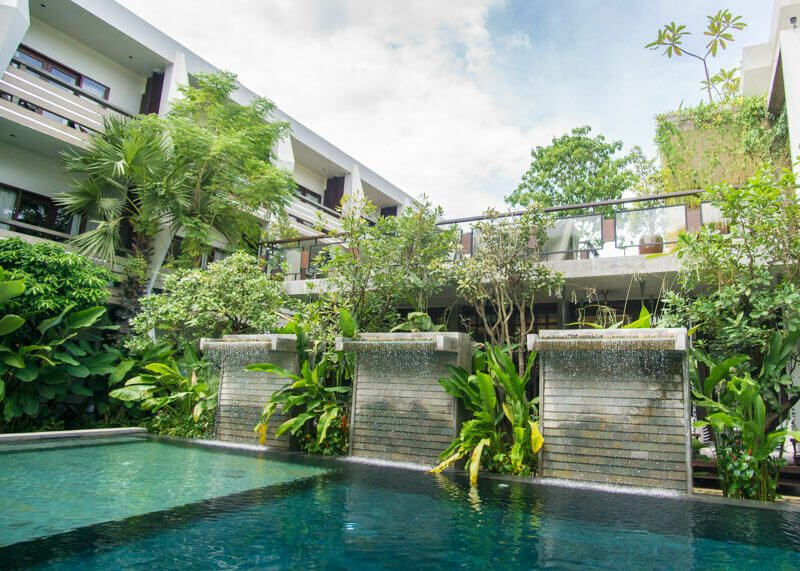 While not as grand, the second pool is still very gorgeous with beautiful tropical plants surrounding it. There are even multiple waterfalls in the main swimming pool! The silver futuristic theme continues in Sky Bar, where guests can relax after a long day of temple hopping. 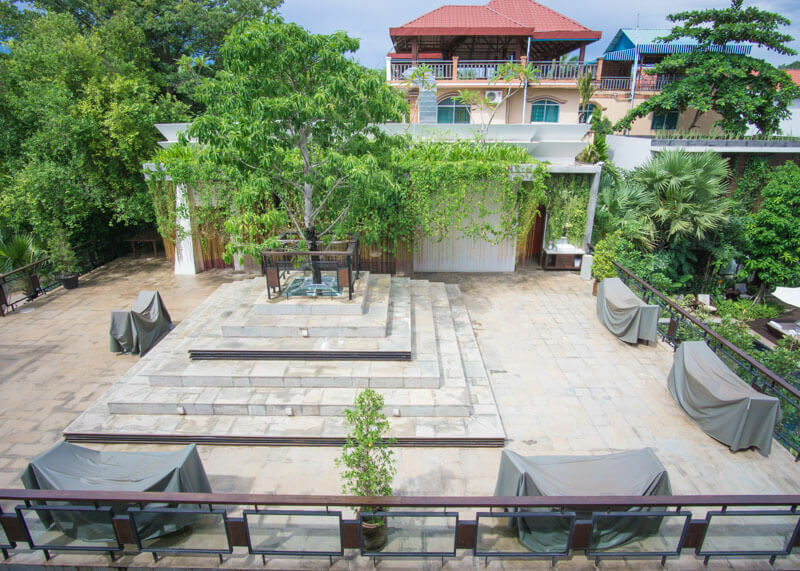 You can catch the Cambodian sunsets on the side of the bar or sit in an area that overlooks the courtyard. 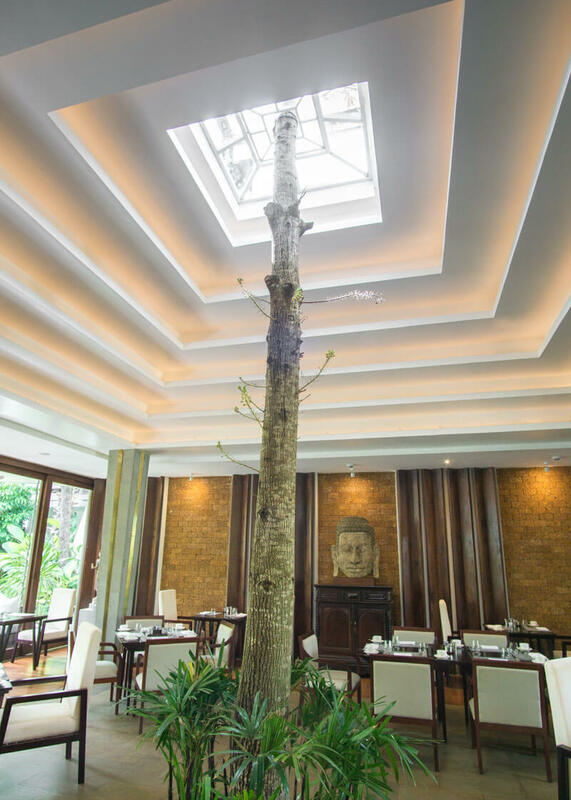 What’s cool is that you can see the top branches of the Buddha tree that grows right in the middle of the restaurant. Which leads me to talk about the design of the restaurant. The tree you saw in the first photo grows in the middle of the hotel’s restaurant. Trorkuon restaurant seems to revolve around the Buddha tree. This design is a creative way to pay respect to nature and the life that trees give to the world. 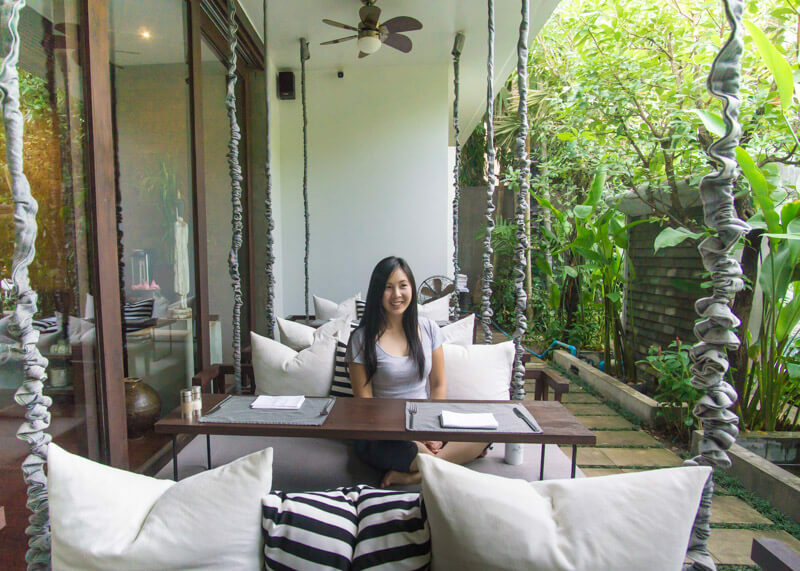 If you want to enjoy your food outdoors, then you can hop onto one of the many swinging seats. What a perfect way to float with your delicious meal! Every guest that passes through Jaya House is reminded of a powerful lesson. The reminder is that every person on this planet has a critical role to make the world a better place. Sometimes you might feel as if your efforts are minuscule and it won’t make an impact on the world. But that’s not the case. As tourists, we can influence businesses by making them question the status quo. For example, we started refusing plastic straws in Cambodia whenever we ate out. During our third visit to the same Khmer restaurant, the waiter remembered our preference and served water with no straws. Luxury swimming pool and aluminum water bottles. Who says luxury and social responsibility need to be mutually exclusive? 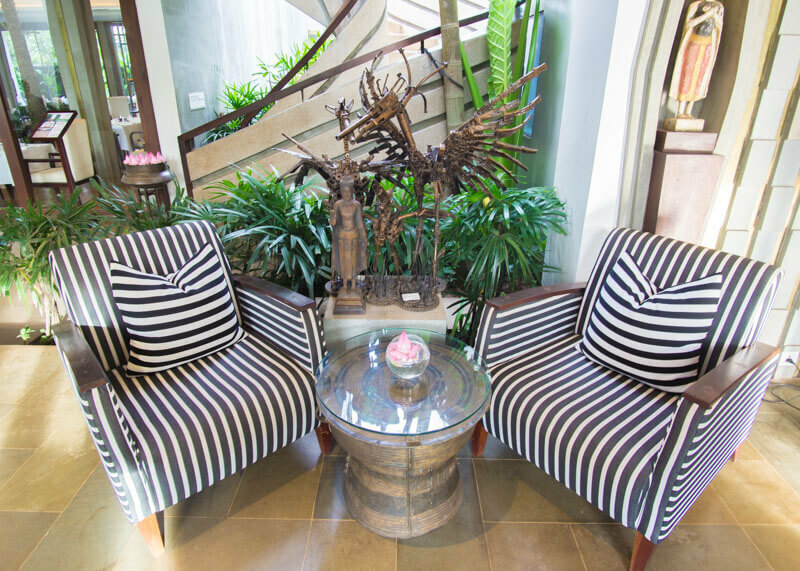 This hotel is a leader in the travel industry, and there’s no doubt that you will leave this hotel feeling inspired. We certainly did. As we continue our year of slow travelling, we will take more action in being responsible tourists. In fact, we are noticing that our small changes have made businesses think about our preferences. All it took was for us to ask a few thoughtful questions and be more mindful as travellers. 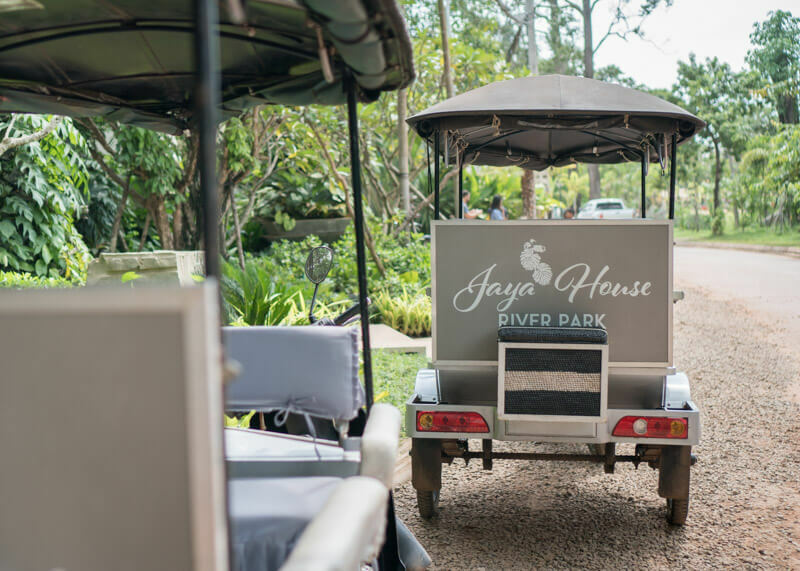 Check them out on their website here for more information or contact them at info@jayahouseriverpark.com. This place looks spectacular! 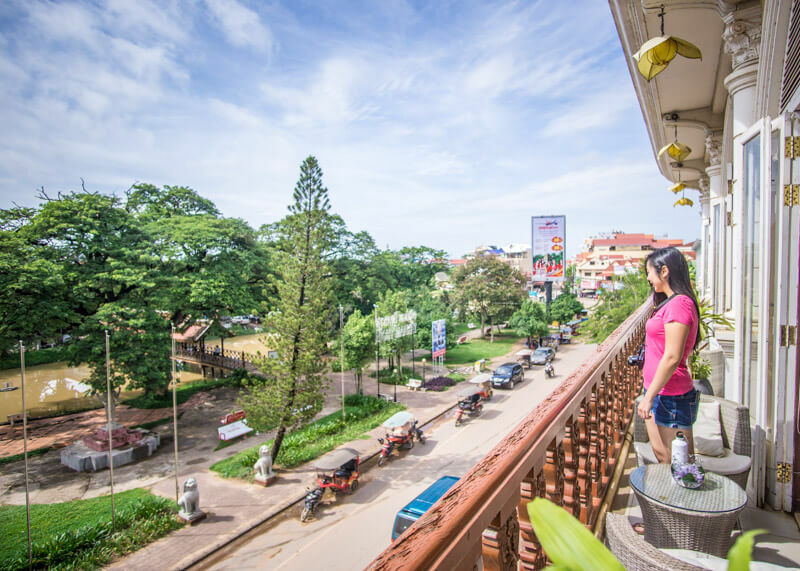 In Cambodia especially, there are so many places working to be socially and environmentally responsible, there’s really no excuse for staying somewhere that isn’t! I agree, especially in Siem Reap where many businesses try to operate in a socially responsible manner! <3 <3 <3 MISS YOU!! I hope you have the chance to one day! This is a beautiful hotel, made more beautiful by the dedication to the environment. 95% plastic free is an amazing accomplishment. I really hope more and more businesses take the steps necessary to save our world. And when such businesses lead by example, it’ll permeate to the rest of society. We all have a role to play. Thanks for sharing little sister. I agree! I hope businesses see that luxury travel and corporate responsibility do not need to be mutually exclusive! I think our generation is trying to be more conscious of how we spend our money and hopefully more businesses recognize this. Beautiful place and I’m happy to hear about reducing plastics, hiring a female Tuk Tuk driver but wondered what their ratio of foreign born verrsus local workers? Looks like a beautiful place to stay. Especially that silver swimming pool! I’d love to stay here, mostly just because it seems like a fantastic place, but it would also give me a warm and fuzzy feeling knowing that my business here is helping more than just a business, it’s helping the community and the environment. Indeed, you will be impressed by the innovative thinking that the leadership and all the staff members have at Jaya House!